The Movado Series 800 men’s sport watch is a cutting-edge timepiece that lets you bask in an incredibly powerful interpretation of our iconic Museum dial. It features a 40 mm Performance Steel case with a blue aluminum sport bezel and rugged screw-down crown. The round, blue 3-hand dial has a silver-toned signature dot, hands and applied stick markers, printed Arabic minute index, luminescent details, and date display. The Performance Steel link bracelet utilizes a secure deployment clasp to ensure your stylish watch always fits perfectly. This iconic wristwatch for men includes all the quality components you expect from Movado. The sapphire crystal glass shatters- and scratch-resistant and the Swiss quartz movement ensures the watch is accurate, reliable and requires minimal manual maintenance. The Series 800 watch is water resistant up to 200 meters. 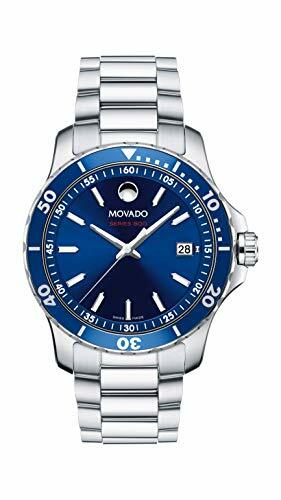 Movado, the flagship brand within the Movado Group Inc. portfolio, was founded in La Chaux-de-Fonds, Switzerland in 1881, and acquired by the corporation in 1983. Recognized today for its iconic Museum dial and modern aesthetic, Movado has earned more than 100 patents and 200 international awards for watch design and time technology, and Movado timepieces are in the permanent collections of museums worldwide. This long, rich heritage of artistry and innovation in design and a close, enduring association with the arts continue to define the Movado brand identity. Always in motion, Movado creates modern watches of exceptional craftsmanship and design distinction.DYNAMIC, MODERN DESIGN: The Movado Series 800 men’s sport watch is a cutting-edge timepiece that lets you bask in an incredibly powerful interpretation of our iconic Museum dial. SAPPHIRE CRYSTAL GLASS: Sapphire is the second strongest element on the Mohs’ Scale (measures the hardness of materials) making sapphire crystal the most durable watch glass and least prone to shatter or scratch.